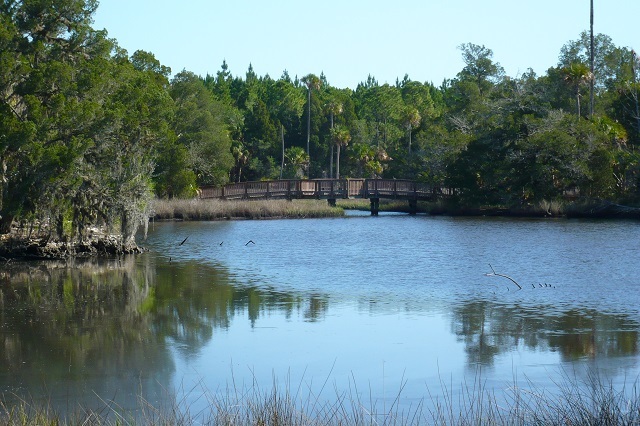 This Town of Yankeetown property features salt marsh, pine flatwoods and mixed hammocks of hardwoods, cedars and palms, plus tidal ponds and creeks. Visitors have over 3 miles of well-marked hiking and biking trails to explore. The Ellie Schiller Education Center has programs, museum exhibits and a butterfly garden. Guided group tours can be arranged by calling in advance. Start your exploration on the Salt Pond Trail, which has an extensive wheelchair-accessible boardwalk. Near the western end of the preserve stands a 30-foot observation tower with a magnificent view of the immense salt marsh and tree islands on the Gulf of Mexico; watch for Osprey and Chimney Swift zooming past. Look and listen for Clapper Rail, Great Egret and Tricolored Heron here too. A kayak launch is located at the far western end (be prepared to tote your kayak about 0.3 miles from the last parking area); paddle your way along the tidal creeks down to Bird Creek Park at the end of CR 40; consult a tide table and the weather beforehand. Butterfly viewing is excellent at this site! Look for Queen, Red Admiral, Gulf Fritillary and Black Swallowtail; the salt marsh and tidal flats host Aaron’s Skipper, Salt Marsh Skipper and Eastern Pygmy-Blue. Search among the red cedars for Sweadner’s Juniper Hairstreak.